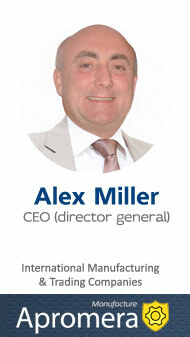 The company APROMERA welcomes to our Website. Here you can find the information about the company and our products. 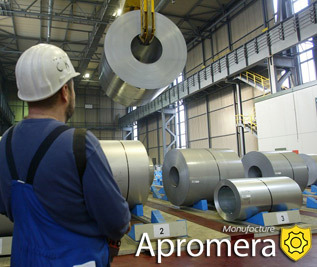 APROMERA is an enterprise for production of various house-holding and gardening tools of galvanized steel and plastic. Snow-removal and gardening tools wholesale from the manufacturer. The enterprise APROMERA produces construction and domestic goods for houses and gardens. Galvanized buckets and coloured buckets. We produce the above –mentioned buckets capacity 5, 7, 10, 12 and 15 Litres. Bucket handles are made of galvanized wire and lugs are made of thicker galvanized steel. Such buckets are more practical and durable. We also produce various galvanized containers from 9 to 100 Litters. Spades, shovels, snow shovels, rakes. Forks and hoes are also on our production list. And this list is far from being ultimate. All the products are made in powder coating and undergo strict quality control. The production facilities of the company are situated in Ukraine and Moldova. Private enterprise APROMERA was founded in 1995. Currently, the number of employees is about 150 people. The enterprise uses modern technology and equipment, which allows us to make the products of consistently high quality. We produce competitive products which are in demand in the markets of EU (European Union): UK, Germany, Spain, Czech Republic, Poland, the Netherlands, Belgium, Sweden, Finland, Lithuania, Latvia, Estonia, and also in the markets of the former Soviet Republics: Ukraine, Russia, Belorussia, Azerbaydzhan, Kazakhstan, Tadzikistan, Uzbekistan. The geography of our customers and the area of the realization of our products are constantly expanding. We are always open to mutual cooperation. There are also partner and dealer programs for our customers. The annual capacity of the company is approx. 3.0 mln. items. During the production the company uses raw materials and components of high quality which are produced in EU and in Ukraine. The production capacity of our enterprise is able to meet the needs of any customer. The production reserves enable the company to increase the number of products by 1.5 times. All the products are made of high quality raw materials. Our motto is: Standards and Quality. APROMERA is a plant and factories with 20 years of history. The experts of our enterprise follow innovative solutions and technologies which appear in metal production, that’s why our production base complies with the requirements for this equipment. The company team is always looking for ways to improve production efficiency, maintain a high level of production quality and expand its range of products. One of the main ways of increasing the effectiveness of the company at the moment are measures aimed at improving the quality of customer service, as well as expanding the product range. During the production great importance is given to environmental protection. Environmental measures, developed by the specialists of the company allowed minimizing the amount of harmful emissions into the atmosphere, and today they are much lower than the maximum allowable level. We ensure that only flawless raw materials are used in our production facilities and only best products worthy of APROMERA reach the customer. The Apromera Company takes pride in offering the widest selection of quality merchandise at the lowest prices and invite you to become one of our many satisfied customers. All our activities are geared towards safeguarding and further strengthening the long-term cooperation. We aspire to a cooperative and long-term relationship with our business partners that is characterised by fairness, trust and reliability.